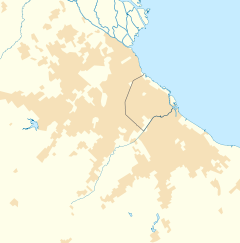 El Palomar is a town in the urban agglomeration of Greater Buenos Aires in Argentina. It is located 20 km (12 mi) north-west of the Buenos Aires. El Palomar was established with a station by that name belonging to the Buenos Aires and Pacific Railway (Spanish: Ferrocarril Buenos Aires al Pacífico) opened in 1910. Developer Publio Massini sold the first lots on November 8 of that year, and Juan Manuel Giuffra established the El Palomar Development Council, which obtained electric lighting for the area in its early years. The city is home to the National Military College (Spanish: Colegio Militar de la Nación), the 1st Air Brigade (Spanish: Primera Brigada Aérea) of the Argentine Air Force, and El Palomar Airport. The Italian Society of Tiro al Segno (Target Shooting) (S.I.T.A.S. ), is located in Palomar. Horse riding, tennis, soccer, yoga, shooting, hockey, bodybuilding, and other sports can be practiced here. In an annex is the training venue for rugby and hockey. French automaker PSA Peugeot Citroën has a manufacturing plant in the area as well. El Palomar is served by Ferrocarril General San Martín commuter rail service at El Palomar station with easy access to Retiro Station in downtown Buenos Aires, as well as by National Route 7. Inaugurated in 1944, Ciudad Jardín was conceived with the idea of creating a garden city that offered a balance of urban life with green spaces, a city within a city. The area once had a German school, Gartenstadtschule — Colegio Ciudad Jardin —. ^ "Clima en la Argentina: Guia Climática por El Palomar Aero". Caracterización: Estadísticas de largo plazo (in Spanish). Servicio Meteorológico Nacional. Retrieved 7 October 2017. Wikimedia Commons has media related to El Palomar (Buenos Aires). This page was last edited on 29 January 2019, at 04:52 (UTC).